I've upgraded my murena heavily on the electrical side. I have installed a hp powerbox for all electrical outputs, so I have a clean 12v+ for every lamp etc. All dash lamps are led now. But then there is the charge light / Alternator warning lamp. As I understand it, you cannot use an LED by default, due to the fact that it doesn't draw enough current to excite the alternator. Therefore I have thought about doing a 100 ohm resistor and a a diode to block 14v alternator voltage going back to the powerbox. 1. Does anybody have some specs for what diode it should be? 2. And the resistor, should it be 2w? 3. And can the LED handle/block the 14v? Your solution is unnecessarily complicated. Matra already provide an 82 ohm resistor in parallel with the lamp in order that the system may still work if the bulb fails, so you simply need to replace the bulb with an LED. The only effect you may notice is that the lamp takes longer to go out due to the lower excitation current. No need to worry about the reverse voltage, the lamp goes out when the voltages either side are equal, so there is negligible reverse bias. Only thing is, that my matra is not only a matra anymore. The engine is a v6, the alternator is a sev marchal, the gauges are vdo, and all electrical wiring is brand new, re-routed to a HP powerbox, which handles all inputs/outputs/switches/realys and fuses. So the output to the led is a limited 12v, even when the alternator kicks in, so I am a little in doubt, when you might have 12v on one side of the led and 14v when charging on the other side. Nice to know about the 82 ohm resistor, but it's not in my car anymore, so I guess by putting a 100 ohm resistor in parallel myself, would do the trick. What are your thought about the difference in voltage on the both sides of the led? Your 100 ohm resistor needs to be about 2 watts power rating. The LED should withstand a reverse voltage of 2 volts, but if you want to be on the safe side, connect a general purpose diode, such as 1N4004 in series. ... No need to worry about the reverse voltage, the lamp goes out when the voltages either side are equal, so there is negligible reverse bias. This not quite right I'm afraid, and could lead to a serious problem. The ignition warning bulb has to allow current to flow BOTH ways and an LED will only work with current flowing in one direction. Why does it need to allow and illuminate with flow in both directions? This is because sometimes the alternator fails and OVER charges. I have seen this a number of times during my working life and even experienced it myself not long ago. So the bulb has to illuminate to warn you of an over charging situation as well as an under charging one. Since the voltage will be higher on the alternator side when it is over charging, the current now flows back to the ignition side and the bulb illuminates. If you put an LED in instead of a bulb it won't work correctly or tell you if you have an over charge situation and anything voltage sensitive can be damaged. Not long ago I was travelling fast along an unlit country road when I saw my charge light start glowing and thought the alternator had failed and was stopping charging but then I noticed the head lights getting brighter and knew the situation was actually worse. If it had stopped charging I had enough charge in my heavy duty battery to reach home safely. 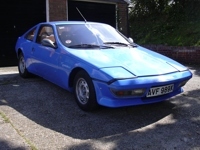 The combination of the charge warning light glowing and the head lights getting brighter alerted me to the fact that the alternator was in fact over charging, so I immediately switched off the radio and SatNav to protect them, and started slowing down quickly to reduce the engine revs and hopefully drop the alternator output. Unfortunately within 30 seconds both head light bulbs blew simultaneously and I was left with no lights to see the road, but at least I had slowed right down! The bulbs blew as the voltage had gone too high. Fortunately there was a good moon that night and with almost no traffic I was able to get to a nearby village safely, where I could put some new bulbs in. Then I drove very slowly keeping the revs just above idle to keep the voltage down which I could monitor by the brightness of the charge warning light bulb (the less it glowed the lower the alternator was over charging), and the replacement head light bulbs lasted long enough to get me home. I have to disagree, the alternator voltage always has to be higher than that of the battery in order to charge it. If what you say is correct then the lamp would always be lit. In a machine-sensing alternator, the regulator and field winding is fed from the ignition warning light via a diode which is forward biased when the alternator is not charging and allows the lamp to light and is reverse biased when the alternator output exceeds that of the battery, extinguishing the lamp. I think that in the scenario you describe, the diode had failed short-circuit, lighting the lamp and causing the regulator to malfunction, or possibly the overcharging had blown the diode, but had the diode not failed the overcharging would have continued anyway without lighting the lamp. Sorry but I know I'm right here Peter. The ignition warning light is basically a form of 'balance meter'. When the voltage is higher one side than the other then current flows from the higher potential to the lower potential and the bulb glows. The bigger the potential the brighter the bulb glows. But it must be able to flow both ways. If the alternator stops charging or its charge rate drops below the correct figure, the potential is now higher on the ignition side as the battery at this stage is still 12v nominal (actually probably 12.8 to 13.0 volts for a battery that has just been charging) as the battery has such reserves that its voltage is slow to drop. The alternator side will have dropped immediately so the bulb starts to glow. Now if the alternator starts overcharging, the alternator side increases immediately above 14.4v which is the normal maximum but the battery will still be at roughly 13.2 volts (a 12 volt battery has 6 cells with 2.2 volts each max.) and it won't change because its mass and reserves do not change quickly, so the potential difference is now the opposite way and the current flows 'backwards' and the bulb again starts to glow. I've seen alternators that have started over charging go over 18 volts but a battery will simply get so hot it will boil the fluid away and buckle the plates before its voltage has increased to match the overcharge voltage. In the sixties and seventies the Lucas ACR alternators had Zener diodes fitted that simply blew if the voltage spiked such as when jump starting but also if the voltage climbed rapidly for any reason. This protected the rest of the alternator. We often used to fix the problem and simply replace the Zener diode and the alternator was fine again. Saved us a lot of work on those vehicles where it was a swine to replace the whole unit, but getting at the back was easy! *P.S. this is another reason for using an incandescent bulb - it takes a certain amount of potential difference and current flow before there is enough to make the element glow.